I finally found some time to sit down with the BUG SDK and play around. They're using the OSGi framework under the hood: a dynamic module framework for Java. 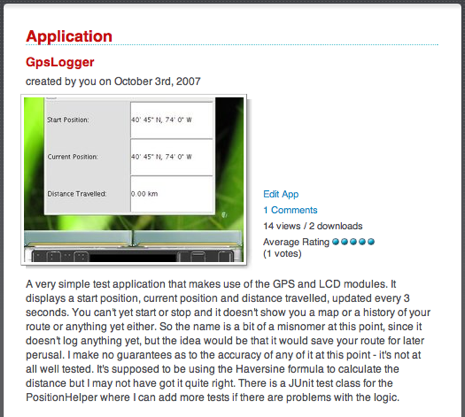 I wrote the beginnings of what I intend to be a GPS logger. So far it just shows a starting position, your current position and the distance between them (using the Haversine formula). There's still some work to be done in the SDK to define the constraints of the actual LCD device - for now the SDK just exposes an AWT Frame - so I haven't spent any time on GUI layout. The VirtualBUG emulator also doesn't work properly on OS X, apparently due to a bug in Apple's implementation of Swing. The buglabs guys have been working on that one but for now I've fallen back to working with it on Debian Etch on my MythTV box, and it's working fine on that. They had their first webinar with the beta testers on Thursday, but we're in the final throes of getting a release completed at work, so I couldn't attend. They've also initiated an application cook-off where they judge tester-created applications and award some prizes. I doubt my humble offering will make it too far in the process, but it was at least the first user-generated app uploaded to the site.